Hello all! How was everyone's Christmas? I had one of the best Christmases I've ever had. I got all that I wanted and I'm not talking about just the gifts. I also ate A LOT! I don't think I've ever eaten that much food...EVER! My family is Trinidadian and there was a lot of them that came from out of town so the house was well stocked. Not to mention my mother and aunt love to bake! I will be in serious gym mode this week. Today is the last set of opportunities for 2011! 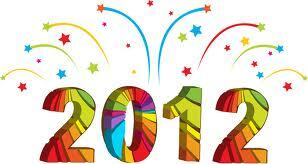 I'm excited for 2012, are you? It would be a good idea to get some submissions in before the new year is here but I know how busy the holidays can be. Maybe you could find some time and plan your submissions for January? It's a new year and a wonderful opportunity to start getting your work out there. Submit, submit, submit! Currently open to submissions of speculative fiction stories written by women. Stories can be 500-5,000 words in length. Deadline for publication on March 1, 2012 is February 15, 2012. Accepting crime, mystery, thriller, suspense and horror stories. Stories should be 1,500-5,000 words long. Contributors are paid $25 for each story published. Writers may submit stories under 1,500 words but there is no payment for stories that short. A yearly journal looking for fiction and narrative non-fiction by students enrolled in a graduate-level creative writing program. Anything from mainstream to avant-garde is acceptable. The deadline for inclusion in this year's issue is December 31, 2011. Cobalt Review is seeking submissions of fiction, non-fiction and poetry. Now accepting prose, poetry, photography and artwork. Submissions should be no more than 5,000 words. NYU's literary magazine is looking for your best fiction or poetry. Deadline for the current submission period is February 1, 2012. Seeking fiction, non-fiction and poetry. A literary magazine looking for fiction, non-fiction, drama and poetry. As always, Black Fox is accepting fiction, poetry, non-fiction and art. The last day to submit for the Winter Issue is December 31, 2011! We are also looking for a few good bloggers to become regular contributors. We are looking for bloggers to contribute as little as once a month or as much as once a week. Email racquel@blackfoxlitmag.com. Our fiction contest is also open until December 31, 2011. Happy Writing! Glad you had a great holiday! I ate too much, but then again that's what those stretchy pants are for. Just wrapped up a story collection for publication, so I'd like to spend more time in the New Year submitting single stories again...this list looks like a good start. Thanks!